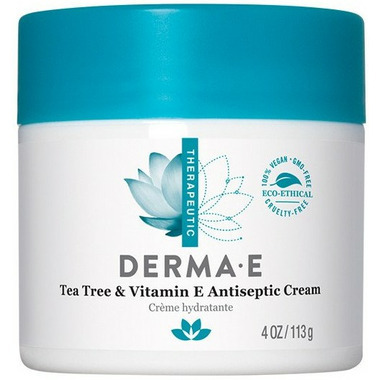 Derma E's soothing, deep-moisturizing cream blends Tea Tree (5%) with Vitamin E (3,000IU) and other synergistic herbs, vitamins and natural oils to comfort skin from a wide variety of conditions such as cuts, scrapes, blemishes, fungal issues, ringworm, blisters, rashes, insect bites, poison ivy, skin overexposed to the sun, dryness and dermatitis. Tea Tree is a potent antibacterial, anti-fungal, and natural antiseptic. Research shows Tea Tree is effective at clearing blemishes, resolving fungal issues and fighting bacteria. Natural moisturizer and antioxidant Vitamin E helps protect the skin’s fatty acids, fight free radicals and hydrate skin to aid in the recovery process. Ideal for those seeking a natural antibacterial, anti-fungal and antiseptic cream that helps protect skin against future problems. May also be used as a daily moisturizing cream for normal to dry skin types. An excellent product which helps my dry skin. I have had great results putting it on my dry legs. Multi purpose cream to me, I even blend it with coconut oil and peppermint for a nice intimate cream, but I also use it straight for any skin issue. Soothing and feels nice. I have been using this moisturizer on my face daily for quite some time. It has realy helped to control breakouts and redness. Great product! I canâ€™t say enough about this cream, itâ€™s fantastic. Iâ€™ve tried so many creams for my excess some prescription and no help, tried this and it was like instant relief. So glad I bought this cream. This cream is fantastic for my sensitive skin with rosacea. At first I was hesitant to use it on my face because of the intense tea tree aroma - but. wow! I'm glad I did. it got rid of the little red bumps and itchiness from my rosacea and is a fantastic moisturizer and it heals up blemishes, too!. I use it as my night cream, so I wake up with clear, soft and happy skin. Love it! I have used this cream for several years to control the eczema on my hands. I found steroids would take away the itching when I was having a flare-up, but they would do nothing to prevent it and even semi-regular use left my skin fragile and easy to tear. This is one of very few lotions I have found that I can even use, including several other lotions recommended for eczema that have caused flare-ups. Purchased this cream for the first time a few weeks ago and I love it! Great for cystic acne, and moisturization. The tea tree smell is very pungent at first, but fades slowly after application. I have sensitive skin and this does not give me any irritation. Buyer beware, some people can have an allergic reaction to Tea Tree. I would highly recommend this cream if you need a moisturizer that does not clog your pores, and cause additional breakouts :) Excellent anti-fungleâ€”anti-bacterial treatment for face and body.